You walk in your house after a long day and slip off your shoes, remove your jacket and toss the mail. With this stylish storage bench from Crosley now you can hang jackets and backpacks along with placing shoes and scarves in the hidden storage area. 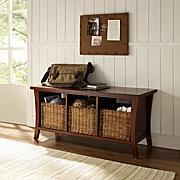 It brightens your entryway, provides instant organization and ends frantic mornings looking for your coat. Received this item broken in pieces. Very Disappointed!! !